Club Zoom would like to thank all the sponsors for supporting our event! Lucky draws were sponsored by AKIRA and ACTIVO during the afternoon events. Top prize included 42inch Akira LED TV. 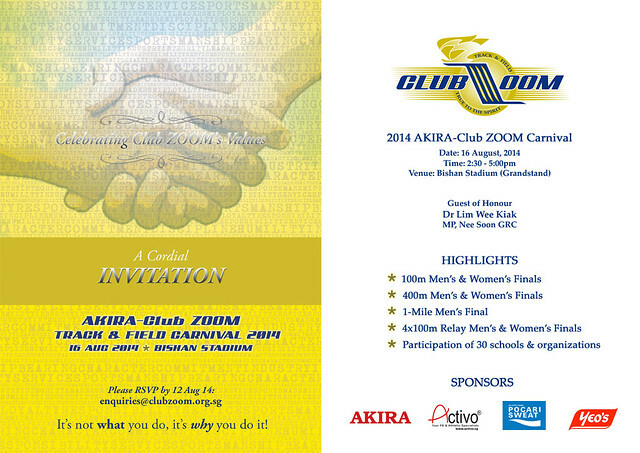 The 2nd Club ZOOM Carnival opens with events for the young ones. The Club is built on the firm belief that athletics is an excellent vehicle for the development of both body and mind and the inculcation of lasting life values, and what better way than to begin that process early in life? The Club Zoom Track & Field Game features six basic athletics challenges. Children between the ages of six and 12 are encouraged to get involved with track & field activities that involve running, jumping and throwing – activities that most kids naturally love doing. By channelling their energy and enthusiasm into an organized track and field programme, children are given the opportunity to learn about themselves, others, and teamwork. In the Club Zoom Track & Field Game, no matter how fast they run, how long they jump or how far they throw, every child is treated like a winner. Each participant will have to complete six Club ZOOM Track & Field Game to earn their certificates of successful participation from Club ZOOM. Our aim at this Club Zoom Track & Field Carnival is to offer an outstanding opportunity for children to make new friends and become committed to a physical fitness regimen through sharing a rollicking good time together in the sun.